Welcome to the Canadian Automotive Partnership Council (CAPC) web site. "To be the location of choice for automotive manufacturing within North America, driven by globally competitive innovation in a profitable and growing new-vehicle market." Then, as now, governments around the world recognized that automotive production can act as a catalyst for rapid economic development. As a result, governments compete vigorously with a wide variety of public policy tools to attract and retain automotive production footprints. Canada actually had to be significantly better than the U.S. In 2004, many would say that Canada did, in fact, offer a more compelling story for investment than the U.S. In the intervening years, the Canadian industry has experienced significant upheaval. The dollar has soared, major industry players have been restructured, and transformational labour agreements have interrupted the competitive calculus between Canada and its NAFTA partners. Certainly, production has steadily recovered to pre-financial crisis levels, but encouraging signs on the surface hide worrying trends. Many have observed that Canada has gone from being one of the lower cost places to build vehicles in the world, to one of the more expensive. The Canadian industry is responding by keeping its cheque book closed. 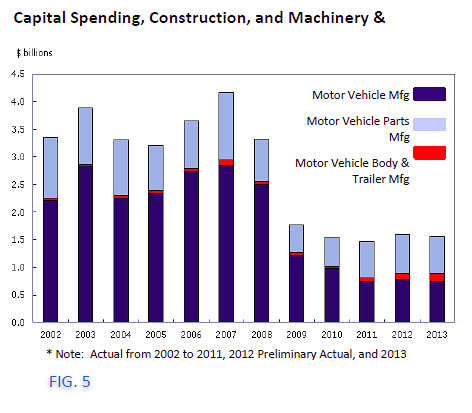 Capital spending is now half of what it was in the 1990s and 2000s. Even without factoring in inflation, spending has dropped to levels not seen since the 1980s. Of the 3.5 million units of assembly capacity that will be added to the North American auto industry between 2011 and 2015, Canada will receive just three percent … despite having 16 percent of production and 10 percent of sales. 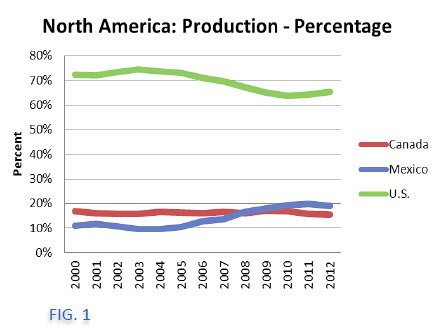 The longer the Canadian industry is starved of investment, the older and less productive its capital base will become. The less productive Canadian plants get, the more difficult it will be to justify new spending; a cycle of spending deferral that, left unchecked, will eventually send the industry to irrelevance. 1. Compete for Investment with Globally Competitive Investment Supports: Given the global competition between jurisdictions for automotive investment and the relatively small size of Canada’s automotive sales market when compared with other auto producing countries around the world, Canada must compete with meaningful, tangible, and effective support measures. 3. Provide One Stop Support for Investment Attraction: Provide a single window experience for investment that coordinates federal, provincial and municipal government stakeholders; similar in approach to that so successfully employed by ProMexico. 4. Improve Transportation Infrastructure and Border Policy: Undertake measures to reduce logistics costs and risks by closing the transportation infrastructure gap. This includes timely construction on the Windsor- Detroit Bridge and taking major action to reduce GTA gridlock without adding new costs to businesses. Also, given the integrated nature of the industry, continue efforts to reduce the cost and improve the speed of the movement of goods and people between Canada and the U.S.
5. Ease Regulatory Burden: Redouble efforts to eliminate unique, overlapping or redundant regulations between provinces, between Canada and the provinces, and between Canada and the U.S.
7. Align the Number of Working Days with Competitor Jurisdictions: The number of days available for work is less in Canada than in the U.S. Ways must be found to maximize Canadian operations’ use of fixed capital. 1. Invest in Plant, Machinery and Equipment: Plants must be up to date with the most productive, effective technology. The Canadian auto industry must respond to the improved fiscal and economic environment (including favourable tax changes, such as the extension of the Accelerated Capital Cost Allowance), by expanding investment in machinery and equipment. 2. Invest In People: To meet future challenges, Canada must become more productive and more innovative. Along with re-investing in its facilities, the Canadian automotive industry must also invest in the training and development of people. Improved innovation and productivity - the lifeblood of the industry – is achieved when companies and countries invest in machinery and equipment AND the people who operate and manage those investments. The Canadian Automotive Partnership Council (CAPC) was formed in September 2002. The Council, consisting of senior executives and stakeholders involved in the industry, was established to provide a forum for industry stakeholders, government, and the research community to discuss common issues and to identify actions to strengthen the Canadian automotive industry in both the short and long terms. "To be the location of choice for automotive manufacturing within North America, driven by globally competitive innovation in a profitable and growing new vehicle market." The Council is a unique and valuable forum where firms who compete daily in the marketplace set aside their competing interests to come together with labour, researchers and governments to collaborate in the best interests of the industry as a whole. This report is an example of that collaboration as it was developed through a process of analysis and discussion among CAPC members. Note:Theviews and recommendations contained herein are a consensus reflecting the collective deliberations of CAPC members and working group participants, but do not necessarily represent the view of any individual, organization or government participating in the CAPC process. The Council has also established a series of working groups that support the overall direction of the Council. The Manufacturing Competitiveness Committee, under which this paper was developed, is one such group, consisting of representatives of all Original Equipment Manufacturers (OEMS), suppliers and labour. The Canadian automotive industry is a critical engine for innovation and economic growth in Canada. By virtually any quantifiable standard, the contributions that the automotive sector makes, either directly or through spinoff benefits to the Canadian economy, are impressive. Those contributions come in the form of assembly capacity, employment, innovation, trade, capital investment, or its capacity to generate spin-off benefits. Dependent upon one’s perspective, the data surrounding Canada’s auto industry can be interpreted as evidence of success or failure. The reality, however, is more textured and examination reveals concerns for policy makers and industry participants. On a positive note, Canada’s eight high-volume assembly plants produce more than 2.4 million vehicles annually. 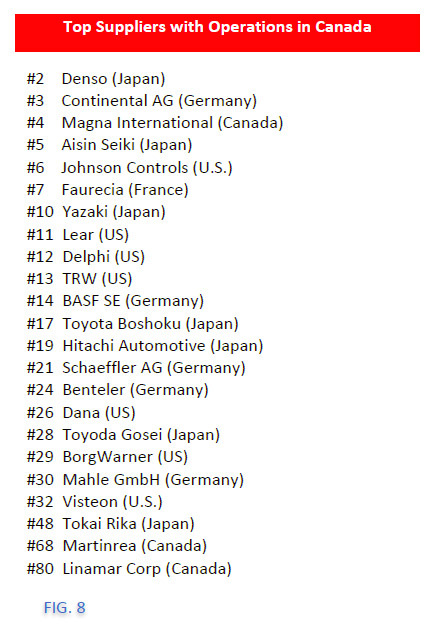 That makes Canada the world's 11th largest auto assembly nation. Despite representing less than 10 percent of North American automotive sales, Canada currently produces approximately 19.6 percent of all vehicles made in the U.S. and Canada and about 16 percent of all vehicles produced in North America, including Canada, the U.S. and Mexico. It is also relevant to note that Canada has maintained a 16 percent North American share of production throughout the period 2000 to current. Meanwhile, Mexico has jumped from 11 percent to 19 percent. To date, all of the Mexican increase has come at the expense of the U.S. While it may be convenient to represent the stability of Canada as evidence of relative success, doing so would be naive. Since CAPC was originally established in 2002, several automakers have closed manufacturing capacity in Canada. Others have added capacity, effectively mitigating the net effect of the closures. However, most of those decisions were made early in the last decade … before the trough … before the escalation of the Canadian dollar … before the U.S. government’s intervention in the industry. Going forward, as the preponderance of North American automotive investment announcements made in the past two to three years come on-stream (investments that have almost exclusively targeted the U.S. South and Mexico), Mexico’s growing share will continue to climb and the U.S. decline appears set to reverse. The eventual effect of this is that Canada will be hard-pressed to maintain its 16 percent share. More than 115,000 Canadians are directly employed in vehicle and motor vehicle parts manufacturing - 7.7% of all manufacturing jobs in Canada. A significant number of jobs were lost during the period 2007-2009, but some stability has returned. 160,000 more are employed in automotive wholesale and retail operations; and hundreds of thousands of additional jobs result from the spillover of the auto industry and the purchasing power of its employees. If Canada aspires to remain a large and relevant automotive manufacturing jurisdiction, doing so on the basis of low cost labour is no longer an option. Instead, it must be a leader in productivity, deploying leading edge technology in both products and processes. Over the past few years, the Canadian automotive industry has consistently demonstrated greater productivity gains than manufacturing overall. In fact, Statistics Canada shows that labour productivity in the automotive sector grew by 22.5% between 2009 and 2012. Annual automotive exports are approximately $64 billion. 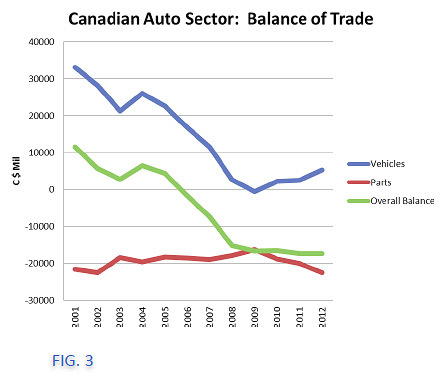 For decades, the Canadian auto sector delivered a large net balance of trade. Historically, the parts sector generated a deficit; however, deficits on the parts side existed to support a disproportionately large final assembly industry. Furthermore, those deficits in parts were always overcome by significant positive balances in final assembly. In 2006, however, a historical positive trade balance in the overall sector slipped into deficit. This occurred because huge surpluses on the assembly side started to slide. Indeed, a $33 billion surplus in motor vehicle trade, which existed as recently as 2001, slipped to just over $7.9 billion in 2012, not nearly enough to mitigate a $22.6 billion deficit on the parts front. Despite the negative trade balance, the auto sector continues to be Canada’s #1 manufactured export, accounting for 14.8% of all Canadian exports in 2013, and Canada’s #2 overall export behind oil. Annual investment in fixed capital (plant and equipment) by the Canadian automotive industry is in the range of $1.5 billion, down from an average of at least $3 billion each year during the early 2000s. This lack of spending may be an offshoot of decision makers’ increasingly pessimistic view of Canada. Prolonged low levels of spending will ultimately make the productivity improvements noted above difficult to sustain. 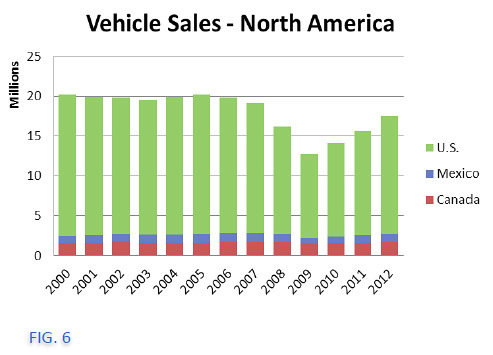 If the trend is not reversed, the effect will be that the Canadian automotive industry will be less competitive. The auto sector continues to be Canada’s #1 manufactured good and a key driver of high- value added manufacturing jobs capable of sustaining a vibrant middle class in Canada. 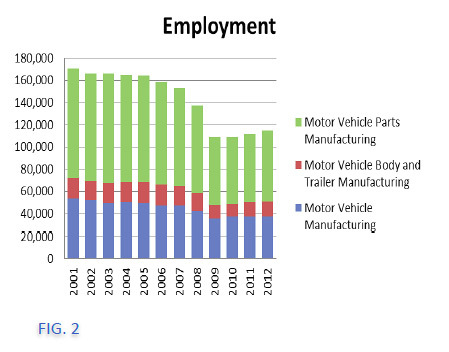 External studies (Center for Automotive Research, 2010) indicate that every one job in an automotive assembly plant supports an additional nine jobs, for a total of ten, in the broader economy. This is the highest multiplier of any sector. Put another way, every assembly plant with 5,000 direct jobs generates a total employment impact of 50,000. In more recent times, the resilience of Canada’s automotive sector saw it through the financial crisis and the deep, prolonged global recession of 2008/09. A historic collaboration between private and public sectors in two countries recognized and valued the integrated nature of the auto industry and supported the auto sector during that difficult period. Now, although the industry would appear to be in a period of recovery, the reality is that many of Canada’s original competitive advantages have been eroded. Canada is not alone in utilizing policy tools to support the automotive industry. It is a century-old practice because policy makers all over the world understand that automotive manufacturing provides a unique and powerful capability to generate significant and rapid benefits to workers, to communities, and to governments. As it has in the past, our industry must continue to adapt, innovate and work together to ensure it remains viable and competitive. Manufacturing is an important contributor to a healthy, sustainable economy, and automotive production anchors and drives the manufacturing sector. It continues to sustain a healthy middle class in Canadian society because it is highly productive and provides high value-added jobs. Over the past decade, despite fierce competition and unprecedented upheaval in the manufacturing sector, FIG. 4 shows Canada’s output ratio has remained relatively constant. Further, as demonstrated earlier in FIG. 1, when production figures are compared from 2001 to 2012, we see that Canada has maintained its share of North American production in the 16 percent range despite the dramatic events of that decade (including a major currency appreciation and the global financial crisis and subsequent recession). Mexico's share has grown from about 12 percent to about 19 percent, while the U.S. share has declined from about 72 percent to about 64 percent. However, a closer look at the Canadian situation reveals a looming challenge if the country is to retain its share of production and investment, particularly when one considers projections into the latter years of this decade and into the next. The truth is this: Canada is no longer getting its ‘fair share’. During the period 2011 to 2015, Morgan Stanley estimates that 3.5 million units of capacity will be added by automotive manufacturers in North America. Of that, the U.S. is poised to receive 63% and Mexico will gain 34%. Canada will add 110,000 units of capacity, just 3% of the total. Left unchecked, the industry will decline. Statistics Canada shows that over the period 2009 through 2011, an average of only $1.5 billion was directed to capital spending. This is a sharp drop from the approximately $3 billion the industry invested annually in Canada between 2000 and 2008. If this trend is not reversed, Canada's production levels will actually decline. Investments have heavily favoured the U.S. and Mexico. Mexico is maturing to become a low-cost, export-friendly manufacturing jurisdiction. The U.S. is starting to benefit from a manufacturing renaissance prompted by “re-shoring”, transformational labour agreements and a renewed emphasis by governments at all levels to support, attract and retain manufacturing operations. Thus far, the re-shoring phenomenon has bypassed Canada. In a developed economy like Canada – one with relatively high cost labour – there can be no manufacturing renaissance without long-term, sustainable, elevated levels of productivity growth. Although the Canadian automotive industry has demonstrated higher than average productivity growth in recent years, relatively low levels of productivity enhancing investments in the post- 2008-2009 period will eventually show through. Productivity will decline, investment levels will drop further, and employment will eventually decline. Canada’s troubling trend with respect to investments in auto-related machinery and equipment has occurred despite the fact that other indicators would suggest that the opposite should have occurred. For example, the appreciation of the Canadian dollar should have made such expenditures more affordable. Meanwhile, the perceived high relative cost of labour in Canada, compared to many competitor jurisdictions, would suggest that productivity enhancing investments in capital equipment should have occurred. Beyond that, tax changes - including accelerated depreciation and lower corporate income tax rates - have enhanced the business case for Canadian investments. It is imperative that policy makers, researchers, and the industry collaborate to understand what is happening here. Have the arguments in favour of investment in the U.S. South or Mexico siphoned scarce resources out of Canada? Are Canadian based executives fighting for investment with the same intensity as in earlier years? Are Canadian governments working with the right tools to compete? Similar questions could be asked with respect to Canada's recent performance in terms of expenditures in research and development. As the landscape shifts, it is essential that Canadian plants be well-invested. Certainly, failure to maintain investment spending in one year does not mean immediate closure or decline, but the buildup of non-spending over multiple years can only lead to a single, inevitable conclusion. Facilities that do not have leading-edge technology struggle to compete, and are less productive, thus perpetuating their owners' decisions to delay re-investment. Canada has witnessed its share of this cycle of non- investment with devastating consequences for affected communities, and our overall automotive footprint. The recent announcement by Ford, supported by the Governments of Canada and Ontario, effectively avoided that fate for Oakville, but that single piece of positive news does not offset an extended list of lost opportunities. Cost comprises a number of elements, the relative importance of which depends on whether one is looking at a parts supplier or an assembler. Significant cost elements include parts and raw materials, labour, transportation and logistics, utilities and taxes. Overall, however, the following observations must be considered. Manufacturing is being directed to the Southern U.S. and Mexico because of the relative cost advantage. The cost differential between Canada and the U.S. South and Mexico results from higher costs in Canada related to labour, logistics and outsourced parts. At least one assembler with operations in both Canada and the U.S. South indicates that, on an annual basis, the costs of operating an assembly facility is significantly less in the U.S. South than in Canada. Productivity is another variable that enters relative cost comparisons. It is important to note that all automakers employ some form of lean manufacturing and sharing of best practices, a condition which limits any productivity divergences between assemblers’ facilities on one side of the border versus another [i.e. a single automaker’s plant(s) in Canada is not meaningfully different, in terms of productivity, than another plant owned by that automaker in the U.S.]. Negotiated contract provisions in Canada have responded to the impact of the rising dollar and new U.S. labour provisions on the competitiveness of Canadian operations. The resulting decline in labour costs in Canada, however, has not fully offset the appreciation of the Canadian currency, so relative costs (in U.S. dollar terms) have increased, and labour costs at current exchange rates are somewhat higher than in the U.S. (and much higher than in Mexico). Differences between Canadian and U.S. pension costs and other benefits provided to employees may also lead to labour cost differences between Canada, Northern U.S. states, and Southern U.S. states. Canadian plants have typically migrated to various forms of hybrid defined benefit-defined contribution pension plans. U.S. plants are almost exclusively defined contribution for new hires; a situation which does not always equate with lower cost, but most certainly shifts future risk. Canada’s traditional advantage of public health care is being eroded because assemblers in the U.S. have been able to shift retiree healthcare costs to Voluntary Employee Beneficiary Associations (VEBAs). That means risk has been reduced in the U.S. as it has shifted from the company to the employee. It must be acknowledged, however, that Canada still retains an advantage in active health care costs. Mexico's significant labour cost advantage is only marginally reduced by higher taxes and transportation costs. Canada has a relatively strong foundation of automotive assemblers and suppliers. Automotive operations in Canada date back to 1904 and today five of the world’s leading global automotive Original Equipment Manufacturers (OEMs) have production facilities in Ontario. The southern Ontario automotive cluster connects a critical mass consisting of five global automotive assembly firms (Chrysler, Ford, General Motors, Honda and Toyota) with world-class parts suppliers and a number of automotive research and development facilities (see Appendix A). Many of the world’s largest and most successful original equipment suppliers have facilities in Canada. However, there are growing challenges. For example, the U.S. is becoming an increasingly attractive destination for auto investment. Particularly since the global financial crisis in 2008/2009, there has been a strong push by U.S. firms to re-shore or move manufacturing operations back to the U.S. from other countries. This re- shoring has resulted in a renaissance in manufacturing in the U.S. that has been supported and encouraged by governments at all levels. Indeed, Michigan recently overtook Ontario as the preeminent auto-producing jurisdiction in North America – displacing the province from its long-held perch. What is also clear is that Mexico, with its low labour cost and proximity to markets is a preferred location for investment. Certainly, when global decision makers look to invest in North America, they always consider the biggest market – the U.S. – first. However, what has changed is that their second choice is now Mexico, not Canada. Therefore, Canada must confront a number of challenges if it is to regain its position as a preferred location for global automotive investment and achieve the vision established in 2004. In this section we look at factors that lead to both opportunities and challenges for the Canadian industry. The Canadian economy has achieved one of the best performances of the G7 both leading into and coming out of the 2008/2009 global financial crisis. Canada has led the recovery among G7 countries, the first to return its GDP to pre-recession levels. Inflation is low and the country boasts the lowest debt to GDP ratio of any country in the G7. In automotive sales, the decline in Canadian vehicle sales of 11 percent during the financial crisis was not nearly as severe as the dramatic drop in the U.S. sales market of 37%, which led to the need for restructuring actions in the North American auto industry. Since the financial crisis, Canada’s new vehicle sales have already returned to pre-recession levels, and 2013 will set a new record. The U.S. is still expected to take several more years to return to its pre-crisis level of 17 million units. U.S. companies earning income in Canada are subject to U.S. taxes. Canadian taxes paid are credited against U.S. corporate taxes owing, effectively eliminating the effect of Canada's low corporate tax rates for those companies. It must also be recognized that many automakers and parts suppliers incurred significant losses leading into the 2009 restructuring, which can be carried forward and applied to future years. As a result, some of those companies are not presently in a position to benefit from low corporate tax rates, and may not be for years to come. Meanwhile, Canada currently permits accelerated capital cost allowances (fifty percent straight line depreciation) for investments in machinery and equipment to be deducted from income. Canada's two to three year timeframe for full depreciation of capital investments compares favourably with the five or more years it takes in the U.S. or Mexico. Again, however, many firms are not in a position to benefit from this due to tax loss carry forwards. In general, it is important for Canada’s tax system to be competitive, and by practically any measure, the Canadian regime is, in fact, a leader. The challenge for the Canadian automotive industry is to generate the levels of profitability that will allow many of its key players to leverage the benefits the Canadian system offers. Canada has a well-trained automotive industry workforce. The results documented above speak to the fact that Canada has the capacity to provide high quality management and engineering personnel. What is equally important to the auto industry however, is the assured quality of skilled trades that the Canadian system provides. The Canadian system of standardized qualifications ensures that individual tradespeople possess a uniform, defined set of skills. This applies to a range of trades, including electricians, millwrights, and tool and die makers. Although this system is well understood in Canada, it may be underappreciated, as similar rigour does not exist in other jurisdictions. An important and sometimes discounted element of new investment location decision making is quality of life in the jurisdiction in question. In fact, research has shown a positive correlation between quality of life and foreign direct investment. By that standard, Canada should perform very well. #9 in the world. As well, the United Nations Sustainable Development Solutions Network, which monitors a series of factors that contribute to individual happiness (i.e. : GDP per capita, healthy life expectancy, perceived corruption, social support, etc. ), had similar findings, again ranking Canada #1 in North America and #6 in the world. At the most basic level, there are two ways to lower cost: decrease the rate one pays for the input (e.g. reduce the labour rate) or improve productivity by decreasing the amount of the input used (e.g. reduce the number of people employed). In a higher-cost jurisdiction like Canada, it is essential that these two elements be effectively balanced. Productivity improvements typically require significant capital investments in new production technologies, robotics, and new processes. While some process improvements are ongoing, the bulk of the "step change" improvements in productivity and innovation for an OEM occur every four to six years when an auto company makes a major investment to build a new plant or retool an existing facility. Earning these new or renewed product mandates, therefore, is essential. Gaining mandates not only secures four to six more years of production and employment, it also ensures the plant is rejuvenated, making it more efficient, more up-to- date, and more difficult to abandon long-term. U.S. equivalents, and the rise of low cost Mexico as an auto producing nation (with all the concomitant infrastructure its rise has generated), measures to increase productivity must be an essential tool for addressing competitive issues in the Canadian industry. U.S. equivalents benefitting from more aggressive labour negotiations. Therefore, to ensure that Canada’s automotive sector continues to innovate and become more productive – to ensure Canadian plants maintain their competitiveness against plants in other jurisdiction -- it is critical that Canadian facilities are capable of attracting new product mandates. The Canadian automotive industry has a well- deserved reputation for quality. Ontario assembly plants have won about one-third of all J.D. Power plant quality awards for North America since 1990. Over the same period, Canadian plants have earned approximately two-thirds of the J.D. Power Gold Quality Awards for vehicles. This has occurred even though Canada has had only about 16 percent of the total assembly plant capacity. 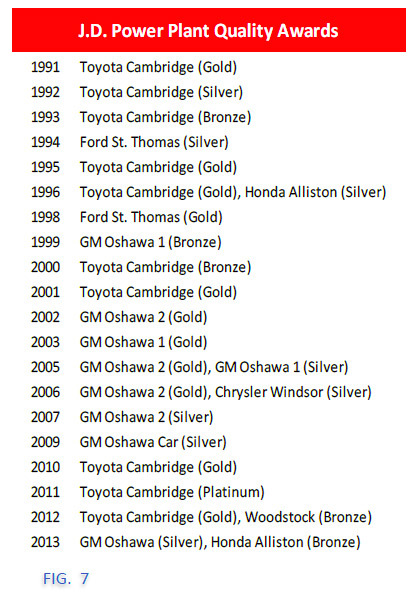 Meanwhile, Canadian-made vehicles also won category awards (placing in the top 3 per category) in the 2013 J.D. Power Initial Quality Study survey. These include General Motor’s Impala, Equinox, Camaro and Regal; Chrysler’s Town & Country Minivan and 300; Toyota’s Corolla and Honda’s CR-V and Civic. Canada has an extensive first-class supplier base that covers every product category. A number of leading global Tier 1 suppliers (e.g. Magna, Linamar, Martinrea) are headquartered in southern Ontario. The graph below shows that many of the world's top OEM suppliers have operations in Ontario. U.S. Access to these markets is assured through NAFTA. Canada boasts a duty-free manufacturing regime (i.e. all tariffs on manufactured inputs and machinery and equipment will be reduced to zero by 2015). Auto parts destined for assembly plants currently are not subject to tariffs, and this represents a significant benefit for Canada when it seeks automotive investments. The zero tariff treatment for non-NAFTA auto parts used in final assembly represents a modest advantage for some vehicle manufacturers in Canada vis-à-vis their U.S. counterparts. Today, Canada is also in the midst of a series of ambitious trade initiatives, the results of which could have a lasting effect on the country's automotive manufacturing landscape. As it pursues its trade agenda, it is imperative that Canada negotiate trade agreements which result in net benefits to the industry; that its negotiators do not sacrifice the automotive industry for other, potentially short term, priorities. Canada’s auto sector has made – and continues to make – economic contributions disproportionate to the sector’s already large size. Other countries recognize the importance of the auto sector and consistently take measures to nurture and grow their industry. Canadian negotiators must not allow a century of success to cause them to become complacent about the role governments in other jurisdictions play in ensuring the automotive industry’s capacity to generate employment and economic growth. Bilateral agreements with the European Union, Korea and Japan, and a multilateral agreement such as the Trans Pacific Partnership could represent a marked change to the industry. Such agreements will require ongoing monitoring to ensure a net benefit to the Canadian automotive industry from the perspective of manufacturing and sales, as well as the import and export of finished vehicles. Canada's automotive manufacturing industry supports free and mutually beneficial trade. Indeed, the Canadian auto sector was built on trade; the industry having evolved in response to a series of trade initiatives dating back to its earliest days and the introduction of production in Canada more than a century ago. The most visible of these initiatives was the original Canada-U.S. AutoPact, which eventually led to the Canada-U.S. Free Trade Agreement and finally to NAFTA. The point: smart and strategic trade policy has always been a feature in the development and growth of the industry in Canada. Negotiators need to recognize that the Canadian automotive manufacturing industry has been established to support the North American market only. This is different than many of the countries or blocks with which it is negotiating. The industry in those jurisdictions is host to indigenous players – companies that have a global perspective; that were established to support global mandates. Therefore, any measures that expand their market – to make selling in Canada easier – are welcomed by those firms. Meanwhile, the Canadian industry is comprised of subsidiaries; established and mandated to support a North American market. While Canadian manufacturers may have long-term interest in accessing new markets; making those kinds of adjustments and gaining those mandates takes time and resources. Obviously, any new trade agreements should allow and encourage those opportunities, however, it must be recognized that they are either relatively minor in nature or several years from realization. The burden of regulation can be a costly, high profile irritant, particularly when the benefits of certain regulations are unclear. No automotive manufacturer disputes the necessity for clear standards and regulatory oversight. However, when left unchecked, situations can arise when the costs of regulatory burden are greater than the risks of failure. Insofar as the Canadian automotive industry is concerned, policy makers must avoid the trap of creating inefficient regulations that are not aligned with other auto manufacturing jurisdictions in North America, or which cannot be justified against the costs and associated benefits. Doing so can only serve to fuel perceptions by decision makers that Canada’s cost structure is uncompetitive. The reality is this: 90 percent of the market for Canadian-produced vehicles is in the U.S. The more magnified the negative differences are between doing business in Canada versus the U.S., the less likely decision makers will be to place investment dollars in Canada. Governments in Canada have recognized this as an issue and have responded with specific and welcomed initiatives. For example, the federal government has established the Regulatory Cooperation Council (RCC) and the Red Tape Reduction Commission to promote regulatory simplicity, efficiency and alignment within North America. The RCC has made progress on product regulatory harmonization for consumers in Canada. Canadian manufacturers will benefit from scale economies associated with the changes. Despite the progress, federal and provincial governments must accelerate work in this regard with the aim of making Canada's regulatory regime as efficient and cost-effective as possible. If Canada develops a reputation as a “problematic”, overly regulated jurisdiction, that reputation will pervade, potentially undermining the more positive messages that Canadian industry leaders and politicians may want to present regarding Canada as a location for investment. With so much trade in parts and vehicles between Canada and the U.S., fluctuations in the exchange rate can be a big disruption to the industry. A decade ago, the Canadian dollar was equal to about 70 cents U.S. Today, the Canadian dollar has risen to near parity with the U.S. and has seen levels as high as 110 cents U.S. For automotive suppliers with payments (costs) in Canadian dollars and receipts (revenues) in U.S. dollars, the rise in the value of the Canadian currency resulted in enormous pressure, forcing suppliers to either find ways to drastically reduce costs or lose money and/or close up shop. This pressure came on top of the drastic drop in demand following the financial crisis of 2008 and subsequent global recession. The impact of the rising Canadian dollar tended to be not quite as difficult for assemblers and some parts suppliers. For assemblers, the impact has been partially mitigated by the fact that some of their costs and revenues (given Canada's strong net exports of vehicles to the U.S. and import of parts) are in U.S. dollars. Likewise, for some parts suppliers, especially the largest ones with international operations, a mix of costs and revenues in both currencies has given them a partial hedge against currency fluctuations. The OECD places Canada’s Purchasing Power Parity (PPP) exchange rate at 81 cents, a barometer indicating that the price of goods and services are generally higher in Canada than in the United States. If the Canadian dollar is in fact overvalued to such an extent, it is possible that the Canadian auto industry has learned to over-perform. Therefore, if the real rate moved closer to its true value, the auto sector could be positioned for a substantial rebound. that a competitive advantage cannot be built on a particular exchange rate is not likely to be forgotten soon. For automotive assemblers, a major source of their Canadian dollar cost is their direct labour expenses, representing between 5 and 10 percent of the final cost of an assembled vehicle (including the expenses associated with administrative staff). Until the middle of the last decade Canada’s automotive labour costs were relatively low compared to other auto-producing jurisdictions. The foundations of Canada's labour cost advantage were the relatively low value of the Canadian exchange rate and Canada's publicly funded, universal health care system. Since then, the rising Canadian dollar, the emergence of low-cost production jurisdictions (such as Mexico), and changes in compensation practices in other countries has eliminated that advantage, andCanada’s labour costs are now relatively high. The shift is described below. U.S. dollar before moving back towards parity. It currently trades slightly below parity with the U.S. dollar. While forecasts of the future value of the Canadian dollar vary, and some economists expect the dollar to depreciate further, no-one expects it to return to the low levels that prevailed prior to 2002. Second, Mexico, with its very low labour costs has matured as a manufacturing jurisdiction and has become an increasingly important location of choice for auto production, as a result of its cost advantages and capability to produce high quality vehicles. Third, as a part of restructuring labour agreements in the U.S., the United Auto Workers (UAW) took a number of actions. This included a new system for funding retiree health benefits, effectively removing this liability from the balance sheet of the assemblers into independent trusts (endowed with large one-time payments from the employers). This shifting of responsibility for future health care costs from companies to VEBAs has insulated companies from the risk of escalating future health care costs, and has reduced the traditional cost advantage associated with Canada’s publicly funded health care system. In Canada, similar independent trusts have been set up to fund retiree health benefits at some companies. Even with the U.S. actions, Canada continues to enjoy a significant cost advantage (worth around $4 per hour worked) on health care expenses for active workers. Finally, other features negotiated in UAW contracts also reduced labour costs in unionized U.S. plants. This includes a “two-tier” wage structure that provides a lower wage rate for new hires, subject to company-specific quotas that presently cover about 20 - 25 percent of a company's workforce. Negotiated contract provisions in Canada have responded to the impact of the rising dollar and the new U.S. provisions on the competitiveness of Canadian operations. Base wages have been frozen for several years, vacation entitlements and other benefits have been reduced, and pensions have been restructured. Similar measures have been taken to control labour costs at non-unionized facilities in Canada. The most recent CAW/Unifor contracts also include a graduated new hire program, whereby new assembly workers begin work with lower wages and benefits, with improvements phased in over the subsequent decade. They also receive a different pension plan than existing workers. This plan has the potential to reduce labour costs for new hires, at least during their first years of employment, to levels that are competitive with the UAW new hire system. CAW/Unifor new hires reach full base wages after 10 years. How this affects relative competitiveness in subsequent years will be determined by the evolution of negotiations in both countries, and by the impact of the 20 – 25 percent cap on new hires in U.S. facilities. Investment location decisions are influenced not only by moment-to-moment relative cost factors, but also by the perceptions and expectations of senior decision-makers. In recent years, trends with respect to labour costs in Canada versus those in the U.S. have had a tremendous effect on the perceptions of automotive investment decision makers. If the Canadian dollar was still at 70 cents U.S., as it was in 2004 when the first 'Call to Action' was being compiled, a Canadian assembler's fully loaded labour costs would not be about $50 per hour (expressed in USD) as they are today. Instead, they would be closer to $35. If that was the case, discussions about the competitiveness of the Canadian auto industry would most certainly have a much different tone. A decade ago, low cost labour was a major benefit of making vehicles in Canada; possibly the most important advantage of all. Canadian auto assembly labour costs have been reduced significantly in own-currency terms in recent years. 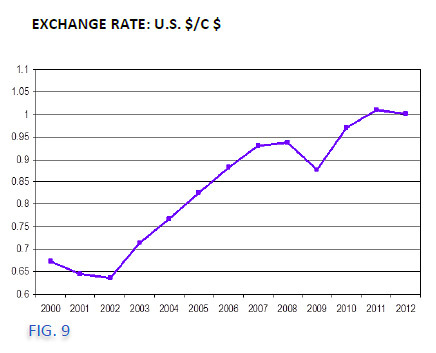 But the appreciation of the Canadian dollar has more than offset those savings when expressed in U.S. dollar terms. Canada’s main advantage vis-a-vis the U.S. has been rapidly eliminated, and this could prove devastating. To inspire the location of investment in Canada, removed from the “head office” and “home market” pulls experienced by international OEMs, Canada needs to have an advantage – and it is no longer labour costs. When Canada had a major labour cost advantage, it received automotive investment disproportionate to the size of its market. Now that this major advantage has evaporated, automotive investment spending north of the border has diminished. Despite the upheaval that has been witnessed over the past decade, the reality is that the fully loaded labour cost for Canadian assemblers is still only marginally higher than it is in the U.S. Mid-west. But rather than focus on fully loaded costs, most discussions around labour costs focus mostly on the base rate. That is because it is easy to compare base rates in one company or jurisdiction to another. 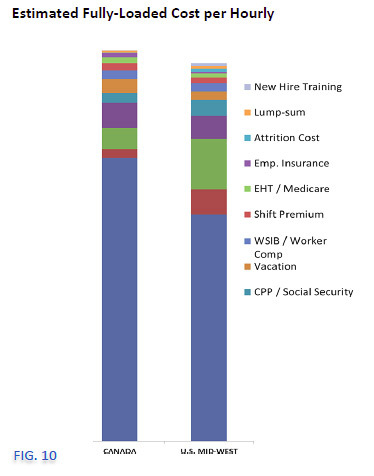 It is more challenging to consider additional cost elements like costs of training or attrition, employee insurance, pension plans, social security, bonuses or other benefits. Per hour base rates in Canada are generally higher than in the U.S. (when the Canadian dollar trades at or near par with the U.S. dollar). It must be recognized, however, that consumer prices are higher in Canada so the real purchasing power of workers’ base wages in Canada is not higher. There can be no disputing, however, that costs do appear higher to international industry executives. On a fully loaded basis, one assembler's data shows that the cost per hour in Canada is also higher, but that company's data shows that the gap is less than $2.00 per hour – within striking distance of their U.S. competition, even with the Canadian dollar at or near parity. In such a difficult and competitive context, ancillary labour costs under government control need to be carefully controlled – for items like employment insurance, the employer health tax and workers compensation premiums. Also, if hard dollar supports for training new or existing employees can be provided, Canadian operations will be able to more confidently declare their costs are below U.S. alternatives. Only then will those advocating for Canadian automotive investment be able to do so with a strong and compelling message. Almost half the states in the U.S. now have laws prohibiting contracts that require workers to pay union dues as a condition of employment. When Michigan became the 24th state to enact such legislation in early 2013, Canadian manufacturers, labour groups and policy makers took notice. Understandably, a significant divergence of opinion exists regarding the efficacy of the “right to work” tool. These laws are clearly associated with lower levels of unionization and, consequently, lower labour costs. Whether or not that leads to more investment and employment is debated. Regardless of the true effect of “right to work” measures, there can be no question that the Michigan legislation has received notice in Canada. Some manufacturers believe it makes Ontario’s most proximate competitor for automotive investment a more compelling alternative. Others doubt it will have a significant additional impact on competitiveness over and above other factors (such as taxes, logistics, exchange rates, and others). Stakeholders involved in the Canadian automotive industry will need to consider both the realities and the perceptions that reverberate from the Michigan decision. Utility costs are largely outside of the control of industry in Canada. However, demand and supply disparities in other jurisdictions certainly impact Canada’s competitiveness. For example, the recent decline of the cost of natural gas is an emerging competitive advantage for the United States. In the case of electricity, rates are largely regulated, often driven by governments' policy goals. It was not many years ago that electricity costs were touted as a benefit of doing business in Canada. More recently, however, a combination of factors – not the least of which is revised policy goals – have converged to make Ontario rates higher than competing jurisdictions. For example, electricity costs for a typical large scale assembly operation in the U.S. South or Mid-west are estimated to be as much as $5 million lower than those in Ontario, a penalty that is now well-known to decision makers. Hydro-Québec’s 2013 survey of power rates in competing jurisdictions shows that for large power customers, Ontario is significantly more expensive. For example, Toronto large power users pay 123 percent more than Chicago customers, 50 percent more than Nashville and 37 percent more than Detroit. In its 2012 study of costs of the automotive parts industry, KPMG provides an explicit comparison of utility costs for firms in Canada, the U.S. and Mexico. For an average sized Tier 2/3 supplier with revenues in the $40 million U.S. range, annual utility costs amounted to $507,000 U.S. (1.3 percent of revenue) in Canada, $466,000 (1.2 percent of revenue) in the U.S. and $537,000 U.S. (1.4 percent of revenue) in Mexico. Transportation costs are another important factor in the competitive calculus of the automotive industry. Shipping is most cost-effective when the value to weight ratio is high. Shipping assembled vehicles long distances is expensive given the relatively large volume they encompass. Thus, when sales volumes permit, assemblers would prefer to manufacture vehicles close to where they are sold. Further, given the integrated nature of the Canadian and U.S. automotive industry, parts may actually cross the border several times before the vehicle is finally assembled. These factors explain why the quality and cost of transportation infrastructure are key to the automotive industry. Once again, the 2012 KPMG study of costs for the automotive parts industry provides a valuable benchmark. $2.020 million (5.1 percent of revenue) for the U.S. These costs differences are aligned with relative distance to markets. The governments of Canada and Ontario should be congratulated for their persistence and creativity in supporting a second span across the Detroit River at Windsor / Detroit. The new bridge, with six lanes and new customs and border processing areas, will represent a significant upgrade to the current situation and reduce both the perception and the realities associated with a so-called thick border. Even though the industry applauds the focus and commitment governments in Canada have demonstrated on the Windsor border file, significant infrastructure issues remain. Crucial in that regard is congestion in the Greater Toronto Area. Furthermore, consideration about the imposition of tolls on 400 series highways is problematic. Obviously, these challenges are more acute for firms that are located in or near the GTA. It is also important to maintain predictable operation of Canada’s railway service and avoid negative impacts on the operation of Canadian automotive firms. The Canadian auto industry recognizes that governments in Canada understand that a transportation infrastructure deficit has emerged. It appreciates the concrete measures that have been taken in some areas (the border being the premier example) and encourages all levels of government to take aggressive measures to address the challenges that exist in other important areas. Competition among jurisdictions for automotive industry jobs is fierce. The reasons are clear. Automotive is a high value-added industry and workers are thus paid proportionally more than their counterparts in other areas of manufacturing or the general economy. Automotive production also acts as an anchor for direct and spin off economic activity, leading to many jobs up and down the value chain. Additionally, the taxes paid by firms and workers contribute substantially to the government revenues that support schools, hospitals and all the other government services that societies require. For these reasons, governments around the world seeking to attract automotive investments offer inducements. It is not uncommon for packages to contain a mix of cash and non-cash programs and for those packages to be very large; in the magnitude of 60+ percent of the capital investment. The flexible mechanisms deployed include refundable tax credits, property tax abatements and infrastructure investments. In Mexico, for example, rarely will one see repayable contributions, or restrictive covenants that can claw back co-investment programs. Through ProMexico, companies can secure cash grants with no strings attached. Considering taxes on labour, one can expect that combined income and payroll taxes will yield in the area of $100 million in annual incremental revenue to federal and provincial governments. Therefore, a typical combined federal- provincial package of $200 million would be fully repaid in approximately two years. Influencers: Once the availability (or lack thereof) of the must haves is understood, investors can start to consider supplementary aspects of their locational decision making. The key influencer in this regard is government participation. In the competition for new plants, the involvement of government is essential and competition among jurisdictions is fierce. Industrial incentives to secure an automotive production mandate represent an important and tangible signal that the jurisdiction in question wants and values the investment. As assemblers strive to maximize the efficiency of their operations through just-in-time manufacturing methods, firms want their suppliers of key parts to be close at hand. This allows them to minimize transportation costs and to optimize the logistics associated with the assembly process. Thus, assembly plants become the catalyst for parts suppliers and the industries that service both assemblers and suppliers. External estimates are as high as a multiplier of 9 additional jobs for every one assembly job (Center for Automotive Research, 2010). It is, therefore, not surprising that competition among jurisdictions for assembly investments is particularly strong. Meanwhile, the Government of Mexico has not been content to rely solely on low cost labour to build its industry; it too has become an aggressive manager of investment incentives. "Mexico'sgovernmentunderstandsit must be competitive in the newly difficult economic landscape to entice foreign manufacturers to make relocation decisions in these uncertain times. Once again, valuable incentive packages are on the table from several sources. Each package is differentas they vary by location, sector, level of financial investment, type/number of jobs created and strategic benefits to Mexico's long term goals. In essence, if your company will be creating quality jobs while making a substantial and long term investment in Mexico; the government wants to help you make that happen." Indeed Mexico is reported to have used a $400 million U.S. loan to have Chrysler/Fiat produce the Fiat 500 in Toluca. While historically, the U.S. federal government did not partner with automotive companies, it recently launched a variety of programs to assist companies in developing the car of the future. For example, programs include funding for battery and electrification research as well as a $25 billion Department of Energy (DOE) loan program for fuel -efficient vehicle assembly and components production. In Canada, the average federal-provincial participation relative to investment cost is about 20-25 percent of upfront capital costs, which is roughly shared between the federal government and the Province of Ontario. The federal contribution is a zero-interest long-term, but fully repayable loan, while the Province of Ontario’s contribution has traditionally been in the form of a cash grant to reimburse a certain percentage of eligible costs. Industrial incentives for automotive facilities in the U.S. have recently been in the range of 25 – 30 percent of total investment (of which a substantial portion may be in the form of grants), although there have been a few investments where government involvement was more than 60 percent. The big difference between Canada and the U.S. is the form of the involvement. Canada’s incentive mechanisms are typically in the form of grants or loans, both of which contain job and investment targets as well as medium and long-term covenants and claw-back mechanisms, whereas the U.S. typically utilizes flexible tax measures that are performance-based, with relatively few covenants and claw-back mechanisms. Canada has traditionally supported automotive production investments with incentives geared to innovation. Appendix B provides a list of federal and provincial government support. The recently announced renewal of the Automotive Innovation Fund (AlF) by the federal government is a welcome sign that Canada is serious about competing for assembly investments. However, its complex structure involving refundable contributions and challenging tax treatments lessens its potential impact to investors. The bottom line is that while co-investments are just one of the important factors influencing investment decisions, they are essential in the competition to anchor investments in automotive assembly. In the paragraphs below, opportunities to improve the delivery of incentives in Canada will be offered. It is worth commenting at the outset, however, that the level of partnership that the governments of Canada and Ontario have developed insofar as automotive investment attraction is concerned is notable. Most important in that regard is the fact that the federal government is at the table. This is not always the case in competitor jurisdictions. However, as indicated, there are opportunities for improvement. Those adjustments are described below. Good decisions are predicated on full and accurate information. Clearly, when firms consider investments – and the placement of those investments – they want knowledge of what they should factor in with respect to government support for the project in question. This notion of certainty has two components: timing and form. Timing: Receiving assurance with respect to government partnership as early as possible in the planning process is helpful. However, it has been observed by some considering investments in Canada that gaining reasonable levels of assurance in an early and rapid manner has not been possible. When that assurance is not provided, Canadian projects – and those advocating for them – are placed at a significant disadvantage. That is because governments in other jurisdictions have learned that success comes not just from offering the largest packages, but offering those packages in a timely way. In the most ideal of circumstances, investors would be able to understand what can be expected without the back and forth that typifies industry to government discussions. Canadians advocating for their projects in international head offices would benefit if they were able to point to clear standards and expectations. In the absence of the ideal – a chart or matrix that articulates how a program or budget will be administered – industry suggests that governments in Canada consider developing a joint (i.e. Canada- Ontario, Canada-Quebec), streamlined approach; one that could expedite the process and provide industry partners with a stronger hand when they advocate for investment with their head offices. makers must weigh them against competing bids. Canadian Federal Government incentives need to be competitive on both a before and after tax basis. In the highly competitive arena for automotive investment, a package that contains an expectation of eventual repayment and which is taxed as income in the year it is received, is not very persuasive. Meanwhile, competing bids are in the form of straight cash: easy to understand, easy to assess, easy to accept. The Government of Ontario, it should be noted, does offer incentives that are provided in the form of cash. The Government of Canada should consider a similar approach. While messages from the Canadian automotive industry in earlier years might have inferred that large-scale inducements were not necessary and that more modest signals and generally positive underlying economic conditions (compared to competitors) were adequate (e.g. a low Canadian dollar, government funded health care costs), this is no longer the case. Automotive plants, notwithstanding their massive size, are portable. Today, automotive assemblers have many choices and options as to where to place their next investment. It is recognized that other competing jurisdictions are successfully utilizing incentives as a key component of their comprehensive industrial strategy to acquire new automotive investment. Therefore, to compete for large-scale automotive investment today, Canada and the provinces must step forward with large- scale, easy to understand partnerships that announce to the world's automakers, "We want your investment and we're prepared to compete." The recommendations below are designed to help governments in Canada support an environment conducive to automotive investment in Canada. Competition for the mandate and facilities that anchor the automotive industry is fierce. Unfortunately, Canada has not seen its traditional share of investment since the economic recovery began. With its strong foundation, Canada can make a compelling case for new investment, particularly if it is competitive in terms of government support. Also, federal and provincial governments have done a commendable job of making overall levels of business taxation competitive. Further tax initiatives should be aimed directly at rewarding investment and job creation. The fully loaded cost is higher in Canada than it is in the U.S. even though the Canadian industry has taken major steps to reduce the gap. More steps are needed in areas under government control. These include employment insurance, the employer health tax and workers compensation premiums. Some jurisdictions do a better job than Canada in pitching for new investments. ProMexico is an example of best practice in this regard. Better coordination among all three levels of government is essential. CAPC applauds the federal government's efforts to keep border links open and efficient. The work on the Detroit River International Crossing is especially noteworthy. Meanwhile, Canada must continue the process of improving the speed and efficiency of administrative controls at the border. For Canada to reap the maximum benefits from its automotive cluster, provincial and local governments need to take concrete action to address a key risk: congestion in the GTA, without adding costs to supply chain inbound and outbound logistics. CAPC members understand and support government efforts to green the economy. It is an initiative that is aligned with the automotive industry’s efforts to reduce the environmental footprint of its processes and products. However, doing so should not put a disproportionate burden on business and should not have the effect of undermining competitiveness and discouraging investment. Free trade must be mutually beneficial. Canada is a trading nation and its auto industry has long been an advocate of increasing prosperity through mutually beneficial trade. As it seeks to develop new trade agreements, Canada should ensure that it gains meaningful and sustained access for Canadian-produced vehicles and encourages investment in the Canadian auto industry. Trade policy initiatives should be motivated by a goal of strengthening investment and production in Canada. 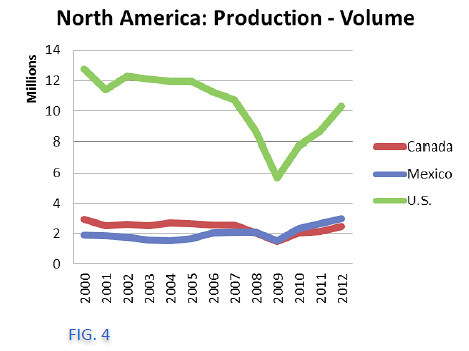 The number of days available for production is less in Canada than in almost all competitor jurisdictions. When a multi-billion dollar industry is idled for just one day, millions of dollars are lost. In today’s competitive environment, keeping plants open and maximizing the use of capital is imperative. In recent years, Canadian automotive firms have confronted the challenges of recession, an appreciating dollar, relatively high cost labour and a political environment in the U.S. that has compelled the industry to place a premium on U.S. investment. But to remain competitive and viable, to avoid the cycle of declining competitiveness, the Canadian industry must heighten investment. Plants that do not have fresh machinery and equipment eventually become less productive and their assets become fully depreciated. It becomes easy to abandon the asset and move on. Firms need to work with all of their partners (including government and labour) to build the best possible business case for investment in Canadian facilities. The Canadian automotive industry can no longer define its success on the basis of low cost labour and an undervalued currency. Instead, future success will be dependent upon global best productivity growth and innovative capacity. That means firms must work with government and its agencies and aggressively invest in both current and future workforces. The Canadian automotive industry has demonstrated pockets of significant and meaningful investments in Canadian research infrastructure. These investments, however, have been inconsistent across segments and companies: the result of differing mandates and proximity. The industry must share best practices and set a positive, mutually beneficial path going forward so that the capabilities of the Canadian research community are understood, represented, and accessed. Over the past decade the Canadian automotive industry has undergone a significant transformation. Various challenges and opportunities have transformed the industry and the capabilities of its key participants. Unfortunately, global decision makers do not universally understand the emerging capabilities that Canada and its automotive industry have developed in terms of its research, capacity to manage complexity or deliver quality. Going forward, the industry must come together and work with government to redefine its source of competitiveness, and devise a consistent framework and message for promotion of Canadian automotive investment to both global decision makers and the Canadian public. Government policies negatively impacting the cost of manufacturing in Ontario, relative to plants with which the industry must compete in other jurisdictions, may detract from a positive business case for new investment. Some of those policies are described below. Despite all automakers in Ontario maintaining independently validated ISO 14001 certified Environmental Management Systems that have targets for reducing the use of energy and other natural resources and diverting waste to recycling opportunities as well as reducing painting emissions in a systematic and efficient manner, the MOE introduced the very duplicative Toxics Reduction Act with very prescriptive planning methodologies and reporting obligations. The majority of substances that have to be traced are either constituents of the steel used to build engines and transmissions (alloys), substances contained in product (such as anti-freeze and paints) or by-products of combustion – related to building heat. Compliance costs for automakers in Ontario are in the hundreds of thousands of dollars per year with no reductions attributable to the program and therefore no added value. No similar requirement exists in any other auto assembly jurisdiction in North America. The Ontario Ministry of Environment (MOE) is considering a proposal for Greenhouse Gas Cap and Trade that is much broader in scope than any regulatory action occurring at the federal level (sector specific LFE program) and is inconsistent with competing manufacturing jurisdictions. Traditionally based on independently assessed approval toxicology for a new paint constituent, an automaker could after thirty days change to a new paint formulation. MOE has recently halted this acceptance process, instead indicating MOE reviews must be completed before the new paint formulation is introduced (even though independent toxicology has determined risk is acceptable). For automakers subject to changing consumer tastes or addressing potential quality concerns this creates an unacceptable new timing uncertainty, not encountered in other NA assembly jurisdictions. Furthermore, noise regulations could be better managed by municipalities. Engineering models have built in conservancy and are used predictively for system design with verification based on site specific field testing allowing for more practical considerations. This more stringent approach based on conservative modeling increases costs for industrial equipment and in many instances there is no commensurate benefit. Extended approval review timing and separate requirements for standardized industrial equipment reviews are being introduced as part of the MOE Approvals Modernization regime. This is creating uncertainties for business. The Ontario Ministry of Environment (MOE) approach is unique in that it requires noise mitigation based on engineering modeling outputs for equipment used in industrial facilities instead of actual noise measurements. For many years, vehicle manufacturers have understood the environmental and economic value of waste that may be generated during the production process. In Ontario, all vehicle manufacturers have introduced sophisticated environmental management systems (e.g. third party certified ISO 14001 programs). This includes waste reduction targets and extensive waste management programs, which currently divert 85-100% of waste away from landfill. The new Waste Reduction Act, as proposed, introduces several unintended consequences under its individual producer responsibility (IPR) approach. This imposes duplicative and costly administration, which impacts third party certified waste diversion and waste management programs now in place. Canadian vehicle assemblers may be required to track and report usages and work upstream … with international suppliers … to identify and validate unique (potentially more expensive) substitute materials. Tracking these requirements demand significant resources and the risk to the integrity of the Just in Time (JIT) delivery supply chain. A new substance Notification SNAc may restrict future uses of Vanadate magnesium in emission control equipment. Pollution prevention notices and requirements in Canada, which limit the application of advanced production materials, such as BPA in structural adhesives, in the manufacturing of vehicles in Canada, while no such limitations exist in the U.S. or globally.